We know that the best kind of marketing is “word of mouth” and we really appreciate you telling your friends and fellow snow pros about this amazing product. And we’d like to thank you for doing so by offering a small thank you. We pay you for all referrals that sign up for a monthly or annual Snowpro Portal website. To join our affiliate Ambassador program you must be a current SnowPro Portal user with a paid plan. You will also need a PayPal account to receive affiliate payments. Then simply activate the affiliate program via your dashboard. 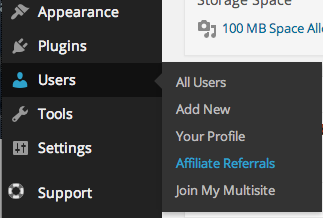 Once you activate the affiliate option the details about the program are available from your dashboard in the “Users” menu then “Affiliates Referrals” sub-menu (see above).